What are the symptoms later in life? What are possible long-term effects for babies with PVL? What research is being done to prevent PVL? Acidosis: Excessive acid condition of the body fluids or tissues. Cerebral palsy: A condition marked by impaired muscle coordination and/or other disabilities ordinarily caused by damage to the brain before or at birth. Hypoxemia: Abnormally low concentration of oxygen in the blood. Ischemic: An inadequate blood supply to an organ or part of the body. Peri: The tissue around the ventricles. Ventricles: Fluid filled spaces in the brain. White matter: The paler and inner tissue of the brain and spinal cord, which consists mainly of nerve fibers. It allows the transmission of information between nerve cells and the spinal cord, and also from one part of the brain to another. 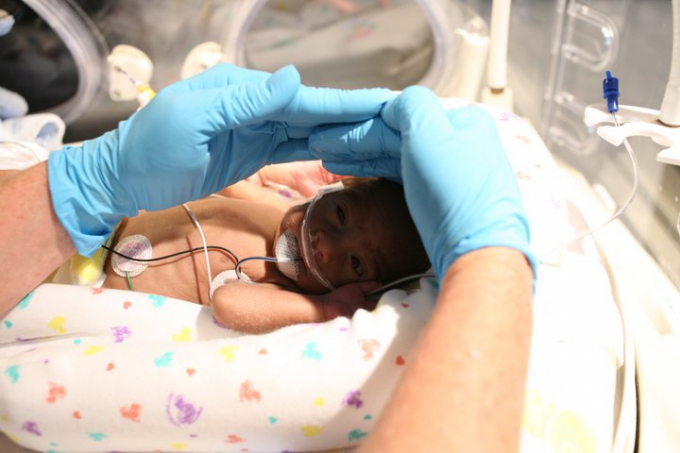 PVL is the most common ischemic brain injury that affects premature infants. This type of injury involves the death or damage of the brain cells, which produce the white matter around the lateral ventricles, which in turn, may create “holes” in the brain or decrease in brain volume. A major cause is the change in blood flow to the area around the ventricles. Hypotension, hypoxemia and acidosis may lead to this injury. Another cause may be an infection that started around the time of delivery. Tight or contracted muscles, especially in the legs. Premature infants are more susceptible to this type of injury. There is no medical treatment for this injury. The infants will have neurodevelopmental follow-ups. Infants may need physical, speech or occupational therapies depending on how they’re affected by the injury. Infants with PVL are at a higher risk of developing cerebral palsy and learning difficulties. Because some of the nerve cells affected control motor movements, one of the long-term effects may be tight or spastic muscles. Because PVL can’t be reversed, researchers are trying to find a way to prevent the loss of cells needed to form the white matter in the brain by using neuroprotective therapies. Some ways used to research the disease are to analyze MRI scans of infants’ brains and to use animal models of PVL to study potential treatments or preventative measures.